I feel a strange tenderness for mushrooms. When I was a little girl, I was fascinated to learn that fungi had their very own taxonomic kingdom, being neither plant nor animal. In fact, they are considered biologically closer to animals because they do not create their own food, as plants do, but feed off surrounding detritus, like vultures. Food for thought. Despite their scavenging qualities, I think they’re charming little alien creatures. I have never been much of a forager for wild mushrooms, afraid as I am of the secret death lurking inside some of them. This is lucky, because I’ve never met a mushroom I didn’t want to eat. 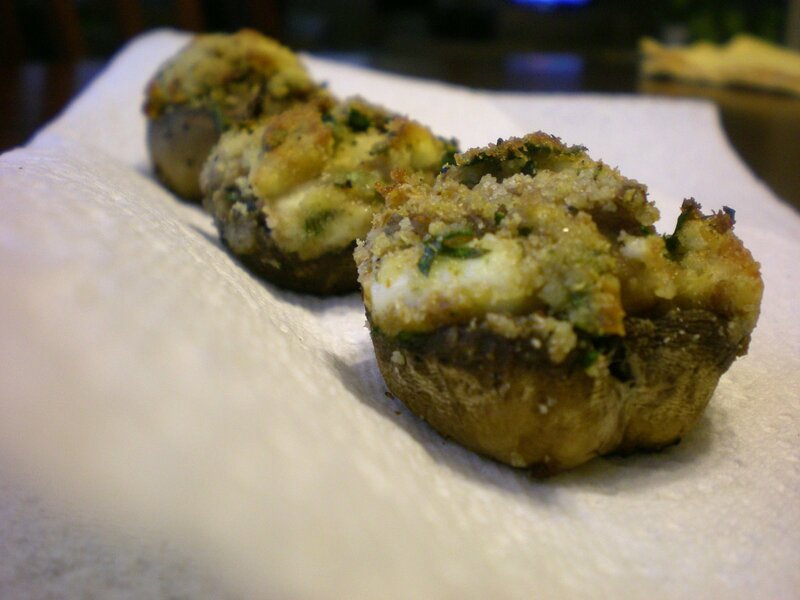 These lemony feta stuffed mushrooms are always a huge hit with whoever I make them for. The crunchy breadcrumbs, the meaty mushrooms, the tart stuffing and the fragrant parsley are a winning combination. They’re a perfect party food (a sure step up from cheese and crackers) and a delightful, light appetizer. I’ve even been known to eat these guys for dinner, smothered in tomato sauce and a little extra cheese. What I like most about these mushrooms, though, is that for all their big flavor they are relatively guilt-free. As far as cheesy finger food goes, this recipe is a good friend to the waistline. Just mushrooms, lowfat feta, breadcrumbs, parsley and olive oil. And there ain’t nothing wrong with that. Preheat oven to 400 degrees. 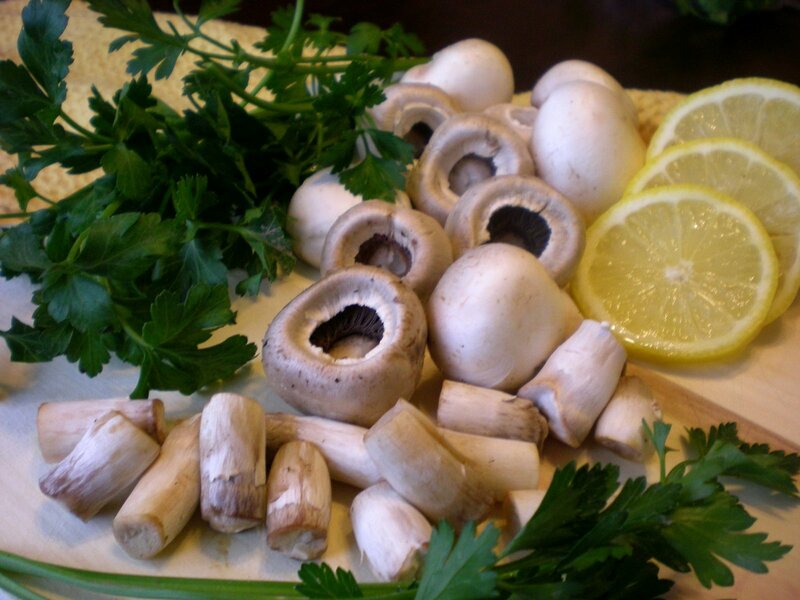 Remove mushroom stems and set aside. Set mushroom caps face-up on a nonstick baking sheet. Drizzle with 2 tbsp. extra virgin olive oil and season with salt and pepper. Finely chop 2/3 of reserved mushroom stems and discard the rest. In a large bowl, combine feta cheese, breadcrumbs, mushroom stems, parsley, lemon juice, garlic powder, red pepper flakes, salt, pepper, and 3 tbsp. extra virgin olive oil. Combine well. The mixture should be loose but a little damp. With a large spoon, each mushroom cap with the mixture and pack it down well. Sprinkle with breadcrumbs and bake for 15-20 minutes or until breadcrumbs are golden brown. Making this again tonight for like the bizillionth. Never gets old. Thank you, Angela!